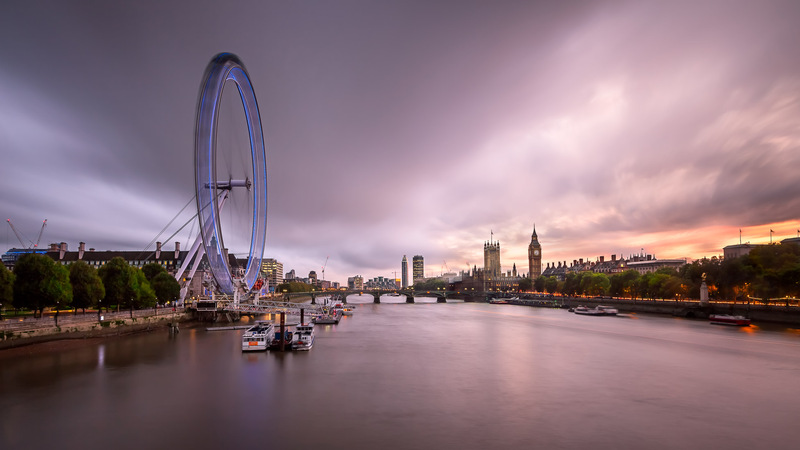 Visited more than the Taj Mahal and the Great Pyramids of Giza, the London Eye is a famous part of the London Skyline. October 2014, single image, additional exposures for highlights, focal length 22mm, aperture f/11, shutter speed 66 seconds, ISO 100, ND 5-stop filter, tripod. One can only imagine the view from the pods out of the London Eye. It is an inspirational place to visit and it appears many have taken it as the perfect place to propose. For Valentine’s Day in 2016 lighting is installed on the London Eye to make it appear like a giant diamond engagement ring. What a photo opportunity! When I visited London in October 2014 the classic lighting of the London Eye provided beautiful lamination to the entire London Skyline with the Clock Tower and Westminster Bridge in sight. This photo turned out beautifully, but I had major problems when taking the shot. I wanted to take long exposures with the ND 5-stop filter attached to achieve this ethereal look with blurred water and clouds. Unfortunately, the bridge I was standing on also served as a bridge for a subway. The train made me and the camera tremble as I was taking the shot. This shaking negatively impacted my long exposures and making the photos end up unsharp. I started to try capture the photo in between trains. Also it is suddenly started to rain. Water dropped on my lens during long exposure and also cause problems. Using a cloth I wiped off the lens of my camera before each shot, but it still proved difficult to get at least one shot without drops. Finally luck turned to me this evening and I managed to get at least one sharp photo without rain drops on it! This entry was posted in City and tagged London, United Kingdom.